I remember a time when I had to rent a VHS from the local video rental store. It wasn’t all that bad, with the only real annoyances being the trip to and fro, having to rewind the movie and the possible malfunction of my VHS player, which liked to eat tape from time to time. When DVDs started replacing VHS tapes, I was one of the first to jump on the bandwagon, eliminating 2 out of 3 of my minor grievances with VHS rentals. Visiting the store again and again became the only real hassle from that point on. But then Netflix came in on its white horse and gave me everything I could possible want— DVD rentals without leaving my home. I was practically the first to sign up. And now movie rentals is even easier with instant streaming online, something Netflix is killing the competition in. Blockbuster went bankrupt and other services like Hulu Plus, Apple, Zune and Amazon are trying to bring the mighty Netflix down. Even Redbox has joined the battle over streaming media. But Netflix is still far superior with over 20 million subscribers, mainly because they offer both DVD rentals and streaming video. And you can stream movies from your Instant Queue on your computer, AppleTV, iPhone, iPad, Boxee Box, Windows Phone 7, Xbox 360, PlayStation 3, Nintendo Wii and most recently—Android devices. They’re even about to tackle the South American market. And if you want numbers—Netflix’s stock (NFLX) soared from around $60 last March to over $230 a share currently. But as Netflix expands, the costs rise. Last month, we all saw an increase in subscription costs. This month, we’re all searching for new ways to get the most from our money. And with a few simple hacks, you can possibly get Netflix for the price you want. 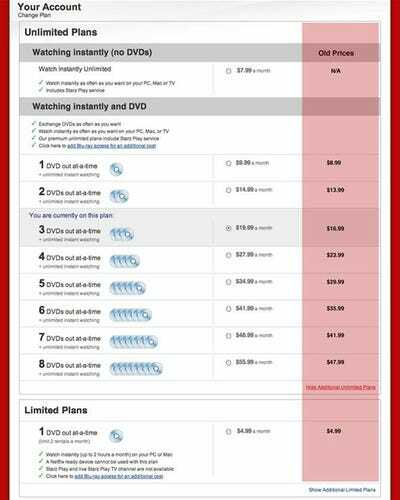 With the new costs for Netflix, you’re probably wondering if you need 3 DVDs at a time anymore, especially since you watch most of your content online now, via your Instant Queue. I know my Netflix DVDs have been sitting in a drawer lately—out of sight, out of mind—since I’ve taking a liking to streaming via my Xbox 360. Perhaps I only need one DVD now? The thing to remember is—Netflix’s streaming movies are not all of their movies. Chances are, you’re going to want a DVD plan, but just in case you only want to stream your movies and TV shows, Netflix now has that option available for you for the low subscription cost of $7.99 a month, right next to the Limited Plan, which only costs $4.99, with obviously limited options, including about one streaming movie a month. Check out the new prices below and see what you really need, 7 DVDs a month… or maybe just 2 a month? OK, so you toughed it out and decided to go with one DVD at a time, with unlimited instant watching. If you had to think long and hard about those disappearing extra DVDs in the mail, then you’ll be interested in this little, perfectly legal hack. Unplggd claims this hack is completely legal in Netflix’s terms of service, so you’re not risking total banishment from mail-order-DVD rentals. “To make up for lost time, Netflix sends out the next available DVD lower on your queue so it arrives on schedule. You’ll see it in your “DVDs at Home” list with a plus (+) sign next to it. In addition, your “Short wait” DVD is still on its way from the farther facility. So, if you’re only at 1 DVD at a time now, try this method out to squeeze an extra movie from time to time. If you’re one of those folks who’s primarily a Netflix Instant consumer, than you know all about those movies in your Instant Queue that disappear without a trace, even if you haven’t watch them yet. Most of the movies that stream on Neflix are deals with the distributor, which could last a few months, a year or maybe even five years. It depends, but you’ll never know unless you check your queue periodically for those expiration warnings. This warning should also display in your Instant Queue on your Xbox 360 or other device. But sometimes you just don’t notice it—but now you can, via Twitter. This can definitely help you get more out of your Netflix subscription—by making sure to watch everything you want! If you’re trying to watch as many movies as you can squeeze into your instant viewing plan, then you’re going to need to get a little quicker with your stop and play buttons. If you’re primarily using your computer for movies, using keyboard shortcuts can drastically improve your speed between one movie and the next. Ctrl+Shift+Alt+C = Codes; frame rate plus other info. Mac users, simply replace the Ctrl+Shift*Alt+* with Ctrl+Shift+Option+* to make the keyboard work for you. Step 5: To Stream or Not to Stream? 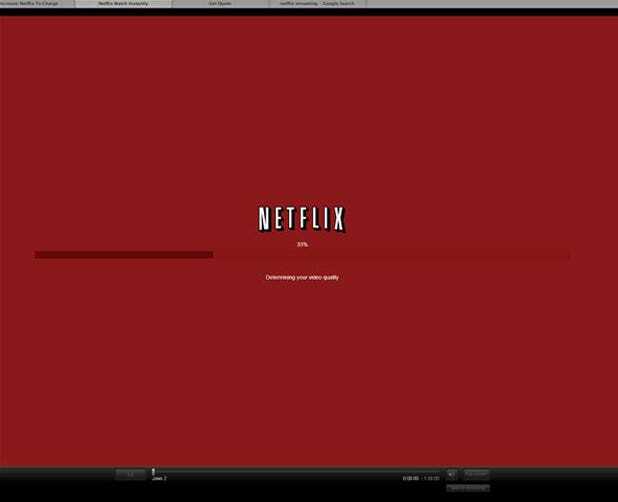 If you haven’t fully taken advantage of the instant streaming features of Netflix, you better start now. Trust me, you’ll love it. To see how to set up your devices to run Netflix, check out all of the tutorials. Either way, I highly recommend choosing the 1 DVD out-at-a-time option for $9.99 a month, to make sure you can watch everything you want to watch. 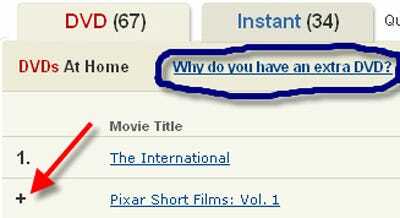 As big as Netflix is, their instant streaming content is still incomparable to their DVD library. And you could also use Step 2 to get an extra DVD every now and then! Via How To Hack Netflix: Free DVDs and Money Saving Tips on WonderHowTo.